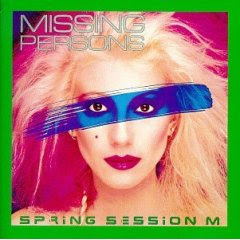 WAIST HIGH: Happy 25th Birthday Spring Session M.
Happy 25th Birthday Spring Session M.
Formed in 1980 in Los Angeles, Missing Persons was founded by guitarist Warren Cuccurullo, vocalist Dale Bozzio, and drummer Terry Bozzio. The band went on to add bassist Patrick O'Hearn and keyboardist Chuck Wild. Spring Session M is an anagram of the band's name and defined '80s new wave music. Says N. Damiano of amazon.com, "If a person wanted to know what the '80s decade sounded like you would give them a copy of Spring Session M."
The pitfalls of celebrity life is told in "Noticeable One," and with a pounding bass and keys starting things off, the moral of "It Ain't None of Your Business" is not to be too stifling or jealous in a relationship, and that trust is what counts. Then comes the band's philosophical take on life, complete with the shimmering keyboards and steady guitar backbeat. "Destination Unknown" deals with the uncertainties of life and the questions posed here must have been dealt (with) by anyone who lives and breathes. Diehard intellectuals might think what's a blonde pop-singer with a quirky voice doing singing deep things, but it's all right with me. "You ask yourself/when will my time come?/has it all been said and done?/I know I'll leave when it's my time to go/till then I'll carry on with what I know." Tell 'em, Dale. With a pounding guitar and loopy keyboards, "Walking in L.A." is a wry, bemusing commentary that the somebodies and cops drive in the city of angels, that only a nobody, jogger, or shopping cart pusher does the title action. With "Words," the guitars slide and bite and sneak in and out, the keyboards create ethereal atmosphere and the vocals can snarl or lilt. Lamenting the alienation and loneliness of our times, (this song says) as much today as (it) did so many years ago: "What are words for when no one listens anymore?" "Mental Hopscotch" was a #1 record on Los Angeles radio station KROQ, and was taken from the bands 1980 4-song EP entitled Missing Persons.